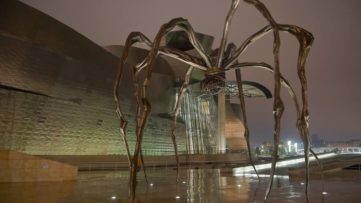 California has been a muse for many of world’s finest artists, and styles as diverse as Pop, action painting, assemblage, Minimalism, Conceptualism and Hard Edge are found in its artistic root. One of those artists is Evan Holloway who has been identified with Los Angeles since the beginning of his career, proving with his original work that innovative art isn’t bound to emerge only from cultural centers like New York and London. After more than a decade long break he exhibits newest pieces in his hometown, with the show being hosted at David Kordansky Gallery. 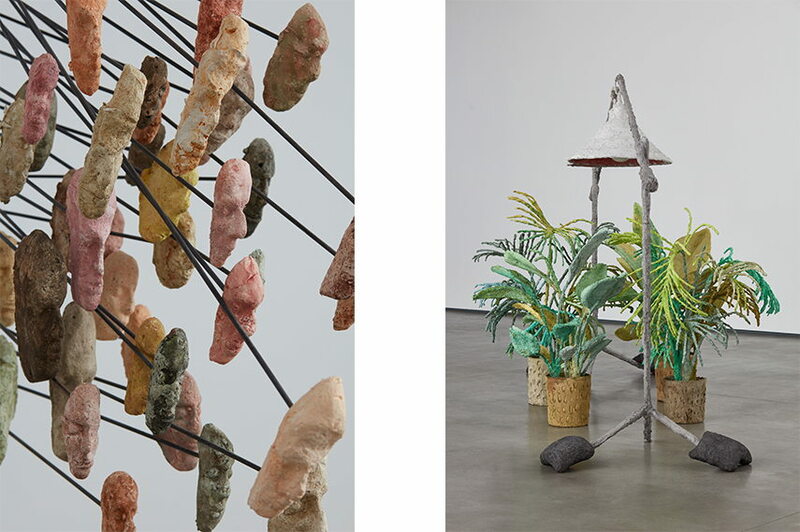 Evan Holloway sculptures follow the West Coast art historical tradition, though he maintained an affinity towards artists and methods that fall outside the Western sculptural tenet. Born in 1967 in Whittier, California, the Los Angeles-based artist Evan Holloway received his MFA in 1997 from the University of California. Following his graduation, he was featured in numerous institutional exhibitions, including: You’ve Got to Know the Rules … to Break Them, de la Cruz Collection, Miami (2015); Projects Series #35, Pomona College Museum of Art, Claremont, California (2008); The Uncertainty of Objects & Ideas, Hirshhorn Museum and Sculpture Garden, Washington, D.C. (2006); The Whitney Biennial, Whitney Museum of American Art, New York (2002), among others. 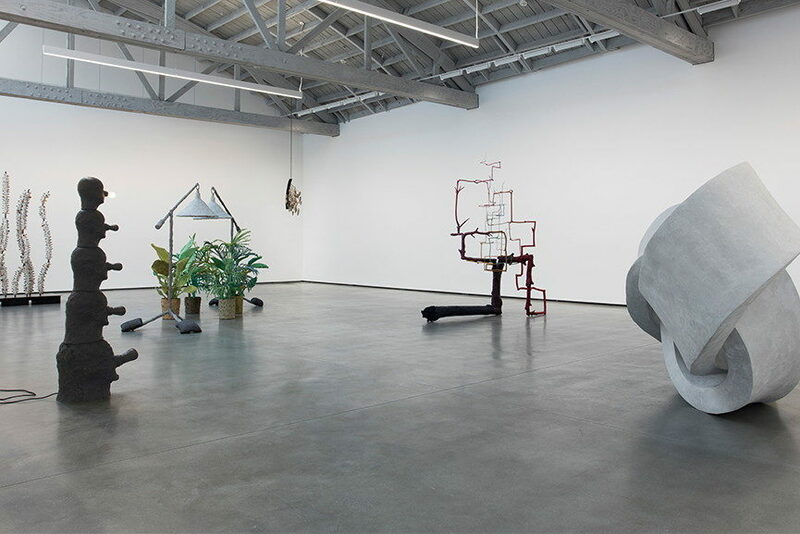 His conceptually complex, yet alluring and accessible sculptural work has heralded an era of “analog counterrevolution,” as the artist calls it, leading a whole generation towards California-based art. Mixing mathematical, alphabetical, and geometric systems in his pieces, Evan Holloway has earned a reputation of one of the most inventive sculptors of his generation. One of the most iconic Los Angeles artists, Evan Holloway has been creating monumental work throughout his career. 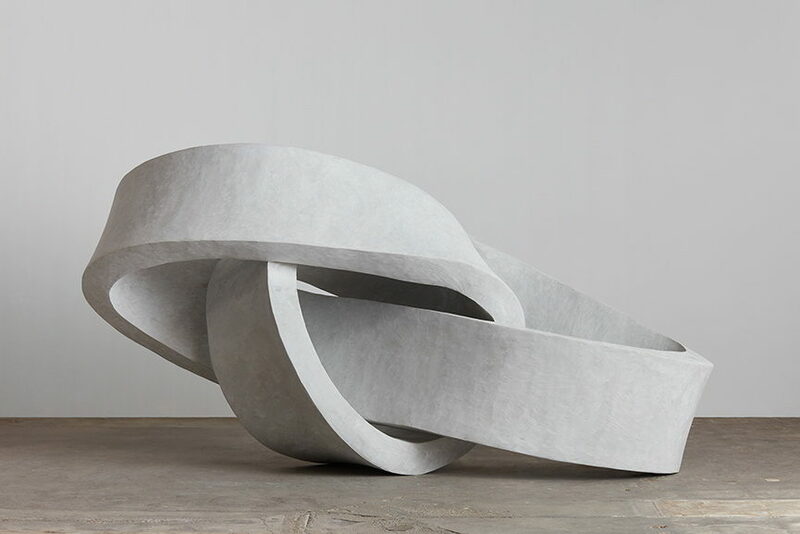 After more than a decade, and for the first time at David Kordansky Gallery, he displays his newest pieces for the Los Angeles public. 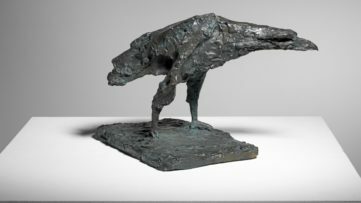 Anyone familiar with his previous sculptures knows of his practice of tree-sculptures, and one such piece is one view here as well. 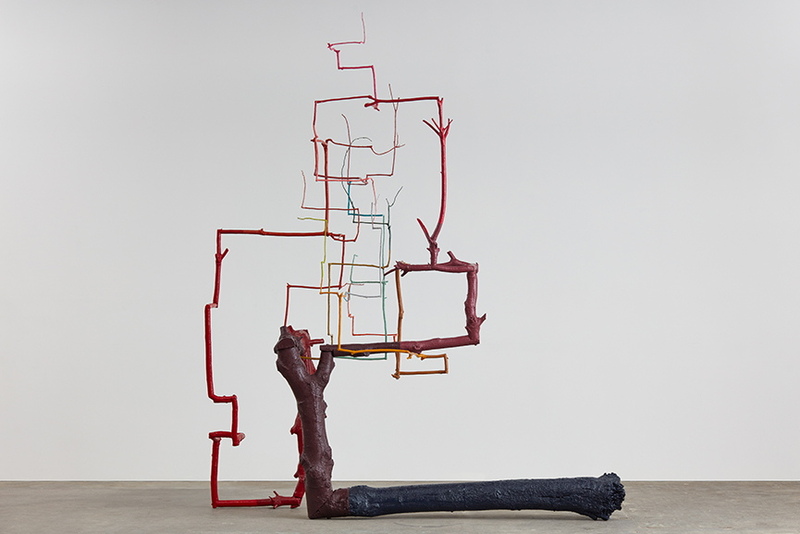 This fifteen year long tradition consists of constructing an object out of carefully dismantled dead branches, rearranged into vertical and horizontal lines often cast in bronze and painted in a chromatic sequence. Another beautiful and mysterious piece catching the eye in the exhibition room is the sculpture of stacked bronze heads whose noses are replaced with light bulbs. Flashing according to a certain pattern, the heads seem to be possessed and channel a visual intensity, making the work both menacing and enticing at the same time. These, along with other innovative new works made by Evan Holloway, will all be displayed in his upcoming hometown exhibition. As much as California has influenced Evan Holloway’s sculptural work, he has influenced the art scene worldwide merging a myriad of systems and color spectrums in his complex pieces. Featuring innovation, mysticism and a distinct engagement with contemporary culture, Holloway presents his newest body of work in his hometown after more than a decade. 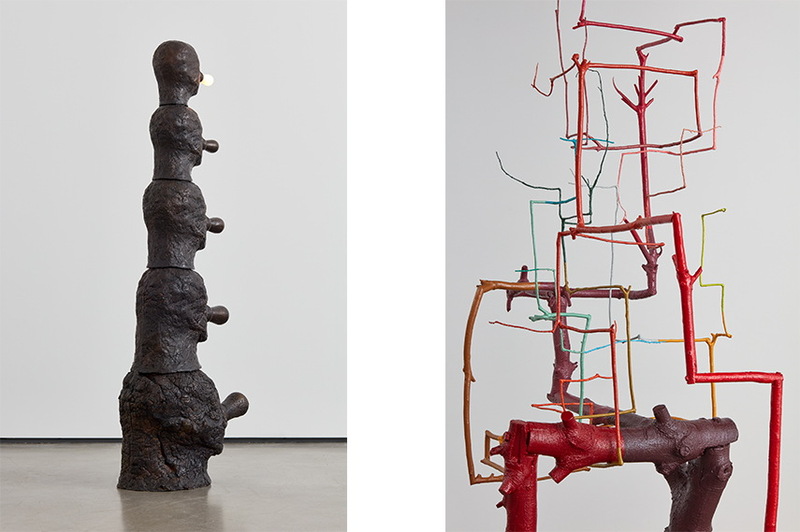 Evan Holloway exhibition will take place at David Kordansky Gallery in Los Angeles starting on January 30th with an opening reception from 6 – 8PM, and will remain on view through until March 26th, 2016. 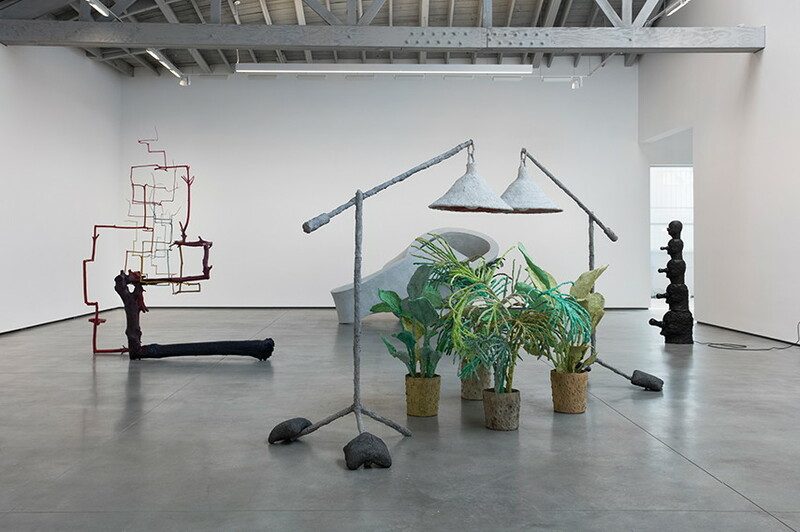 Featured images: Evan Holloway – Serpent and Lightning, 2016 (photo by Lee Thompson); Evan Holloway – Landscape (detail), 2015 (photo by Lee Thompson); Evan Holloway – Benzoin, 2015 (photo by Lee Thompson); Evan Holloway – Installation View at David Kordansky Gallery (photo by Brian Forrest). 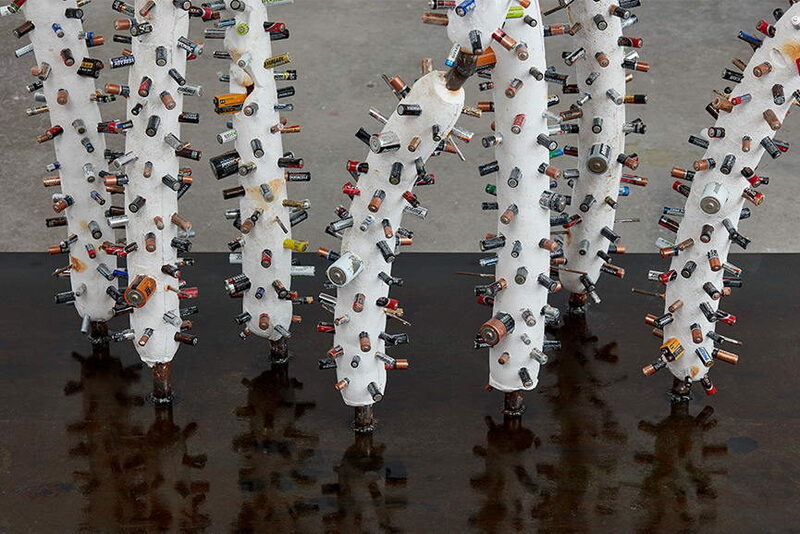 All images courtesy of David Kordansky Gallery, Los Angeles, CA.